Anna Jo writes: In late October 2015, my husband Mike was diagnosed with a form of testicular cancer that involved what's known as a germ cell tumor. After four aggressive rounds of chemotherapy (120 hours straight each) and a surgery to remove the tumor, he was announced to be in remission on February 2016. The illness was sudden, and unexpected at such a young age (27 when diagnosed) and we've both been processing the whole event. This zine is me reconciling the material objects we obtained because of the disease. Chronic is a text-heavy zine about Sam's sleep disorder that she's been dealing with for years since her childhood. As I followed Sam's story through her college years, various doctor appointments, sleep study and treatment in the health care system, I found myself staying frustrated with the ups-and-downs that Sam continuously faced. Sam includes info on able privilege and a recommended reading list. A great read for anyone who is dealing with a chronic illness. I think the biggest lesson for me has been to understand that I am not in control and that I have to forgive myself for not being able to do everything I/other people want me to do. Many people have to learn this lesson when they get old - I had to learn it in my 20s. I'm angry about that, but I have to let go of the anger too. "As you can see, this is the "anxiety" issue. Something I have dealt with a lot in my life. I pretty much have my panic attacks under control not that I'm older. But I deal with anxiety on a daily basis." Jolie writes about working in a high-stress environment while living with anxiety. She shares her experience with different medications, and also why she thought about weaning herself off of them. This did cause her to self-medicate with alcohol and other pills. Jolie praises the benefits of art therapy and a going out to a comedy show with her husband. 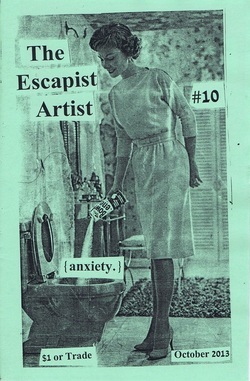 This is the first zine I've carried in the distro that specifically talks about Trichotillomania: the recurrent and persistent urge to pull out one's own body hair. Juliet has compiled some info about the disorder, including bits about its characteristics, environmental stressors & triggers, and 50 ways to stop pulling your hair. While this zine doesn't contain a lot of personal sharing, it's definitely a good resource for those looking to learn more, whether it's for themselves or a loved one. Dee writes about living with Dissociative Identity Disorder (DID) and explains this complex condition. She writes in such a way that I was able to get a decent grasp on the definition of DID. Dee lightly touches on coping with childhood trauma by dissociating, being misdiagnosed more than once, and learning to live with various voices. I applaud Dee for her honesty, detail, and willingness to share her world. "There are seven of us all together, at least that we know about, in our system. Our ages range from three to thirty-five. We are female and male although the body is female." "There are no steadfast rules when it comes to recovering from a mental breakdown. It can take months or even years. It is important not to rush yourself and spend this time focusing on getting to a healthier state of being." Dee begins to unravel the story of her breakdown in this issue (hence the sub-title.) She explains her heavy alcohol use and how it began to impact not only her well-being, but her family and work life, too. Dee writes about being hospitalized, going through detox, and looking back signs of her at "impending doom."